Born in Brazil (Recife, Pernambuco) Eclilson is a highly regarded Master of Capoeira, having taught the art for the past 35 years. Known for his sinuous agility and breathtaking acrobatics, Mestre De Jesus was invited to the USA and Canada in 1990 to participate in various festivals, demonstrating this unique martial art/dance. That's when he decided to make Vancouver his new home. 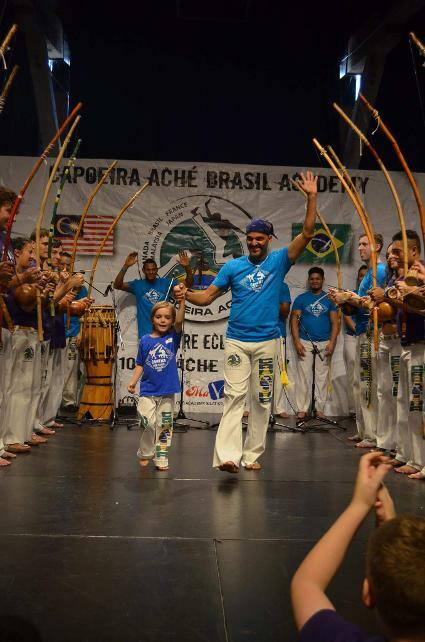 Since then, his professional career has taken him across the world, teaching this ancient Brazilian art form, Capoeira and touring with his music, dance and capoeira performing group Ache Brasil. Mestre De Jesus has appeared on many television programs, performed at thousands of festivals, theatres, conferences and schools. He also works as a stuntman/actor appearing in several movies such as, Ninja Turtles, Blade, Electra, Bionic Woman, Watchmen, Elysium, etc. If we could measure the importance of a Capoeira Mestre to Capoeira, one would need but only two words. Mestre Pastinha, and Mestre Bimba. They are the pioneering Mestre's to Capoeira Angola, and Capoeira Regional. But to all Capoeirista's, they are that and so much more. Great Mestre seam to posses characteristics that set them apart from all others. They are charismatic leaders that attract followers. Their Mandinga are keen and honest. Capoeira Mestre's are not only teachers of the Jogo de Capoeira, but they are mentors for life. They prepare us to move up the ranks and obtain our belts, but they also help us evolve as people. They make us want to learn all there is know about the culture about this art form. Their devotion is deep-rooted and that alone draws us towards them. For most Mestre's, Capoeira is a way of life. It is a way of being and a way of expressing them selves. They represent the present, future and past of this game. They come from a people that lived lives of brutal slavery. Their ancestors existed each day with fear of the unknown, and loss of their free will. The music rituals and philosophies’ have been shaped by this history. The Mestre's of the past and present express themselves through song, and their beliefs are deeply ingrained in the music. It is one of the great examples of how Mestre's directly impact the game and culture of Capoeira. Even though some of them are no longer with us, they continue to teach and guide us. Through time, it is as though the Mestre's legacy enters a kind of mysticism in the ritual of singing their soulful songs or uttering some infamous parables they have composed. We Capoeirista's pay a sort of homage in honor of their memory. We still feel their presence in the Roda. We continue to sense their Ache. Their wisdom and knowledge speaks for itself, and it is not boastful or egotistical. It is subtle yet poignant. The importance of a Mestre to the game of Capoeira, is immeasurable. They allow the game to evolve, therefore making the game immortal.